This is a locational name which derives from the village of Hanby in the parish of Lavington, Lincolnshire. The village name has a Norse-Viking pre 9th century origin and translates as 'Hundi's farm' with 'Hundi' being a personal name of the period. The village name is recorded several times in the 1086 Domesday Book as 'Hundebi' whilst the later name developments include: Thomas Hanbye married in London in 1582, Jan Hanby who married William Dand at Hanover Square, in 1769 and Timothy Hanaby who married Elizabeth Beer in London in 1805. 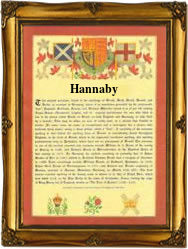 The first recorded spelling of the family name is shown to be that of Roger de Hanby. which was dated 1302 in the Pipe Rolls of Lincoln. during the reign of King Edward 1 known as 'The Hammer of the Scots' 1272-1307. Surnames became necessary when governments introduced personal taxation. In England this was known as Poll Tax. Throughout the centuries, surnames in every country have continued to "develop" often leading to astonishing variants of the original spelling.